Deborah Bennett Berecz (pronounced Be-Reece) obtained her law degree from Notre Dame Law School and focuses her practice primarily on family law, including Collaborative Divorce, mediation, adoption and alternative dispute resolution. Deborah is committed to providing clients an array of options to ensure that the right process is chosen for each individual case. 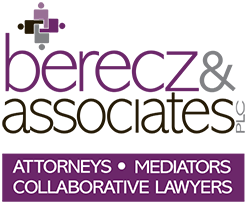 She has been a trained mediator since 1995 and has more than 1,000 hours of mediation experience in family and business cases. She is one of Michigan’s most experienced Collaborative professionals, representing clients in the Collaborative Process in a number of west and central Michigan counties. Deborah believes in community service and has served as President of the Collaborative Practice Institute of Michigan (CPIM), Chair of the Alternative Dispute Resolution (ADR) Section of the State Bar of Michigan and president of her local Rotary Club. Currently she serves on the Hospice at Home board, and was elected to its governance committee in 2015. She has served on the board of ARC, an organization serving the developmentally disabled and is a member of the Family Law Section of the State Bar of Michigan, the Kent and Berrien County Bar Associations, and the International Academy of Collaborative Professionals. Deborah is the author of a number of publications on ADR and is a recognized expert in effective conflict resolution; she regularly lectures for the Institute for Continuing Legal Education, including the Advanced Negotiation and Dispute Resolution Institute (ANDRI), and the Family Law Institute. She has served as a mediation training coach with nationally recognized trainers. Ms. Berecz trains Michigan professionals in the Collaborative Process as part of the team chosen by CPIM. Ms. Berecz is committed to providing her clients with the opportunity to resolve disputes effectively, with respect and dignity for all parties, particularly when children are involved who will be affected by their parents’ family transitions.